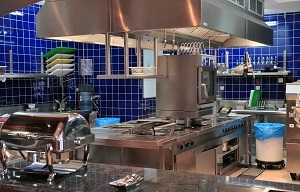 Restaurant kitchen hood cleaning in Cape Cod is one of those services that is not just a good idea, it is required by health codes for all restaurants. A to Z Softwash offers commercial hood cleaning and have greatly helped countless business owners keep a clean kitchen and remain in compliance with industry regulations. Since this is something that must be done by cleaning professionals, it is good to find a company that you can rely on for regular cleaning service. According to NFPA 96 Guidelines, “Hoods, grease removal devices, fans, ducts,and other appurtenances shall be cleaned to bare metal.” This cleaning process is done via hot, pressurized water. This is not the type of service you can take care of on your own safely or effectively. Don't take chances with the safety and cleanliness of your kitchen. Give our pros a call today in order to find out more about what we can do for you. The last thing that you need is to end up with fines or, even worse, getting shut down just because you neglected to find the right team to take care of this for you. This is an essential step to take to reduce the likelihood of kitchen fires. Grease buildup happens quickly and, without proper removal, it poses a big fire threat. In order to make your business be in compliance with both local and national health and fire codes, you also need this level of quality service. To have success, you need a happy and motivated kitchen staff. Working in a dirty kitchen has the opposite effect and can make your staff feel unappreciated. Obviously, this will also enhance the ventilation system which means that smoke and odors will not linger. There is nothing less appealing than having a meal prepared in a kitchen that stinks of smoke and/or food odors from the meals prepared before. You may also be able to take advantage of lower insurance premiums, depending on who your provider is. Some companies reward restaurant owners who make it a point to cut down on fire risks with regularly scheduled kitchen hood cleaning services. The bottom line is that this is simply one cleaning service that you cannot do without. What does matter is that you get a reputable pressure washing crew to take care of commercial restaurant hood cleaning for you. A to Z Softwash has the training, experience and knowledge needed to get the job done. We've been local Cape Cod roof cleaning and pressure washing experts for years. Give us a call to see what we can do for your restaurant cleaning needs, inside and out! If you would like an estimate for hood cleaning in Cape Cod, please call 508-209-7795 or complete our online request form.